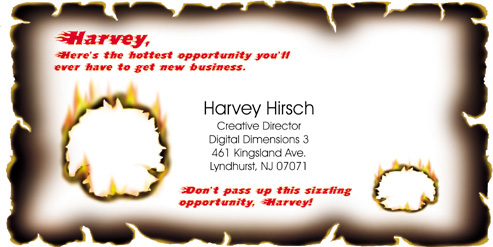 Set your smoldering prospect list ablaze with these fiery new 5 1/2" x 11" HOTCARD. Watch your fingers, Harvey! You are holding one of the most intense marketing tools ever, which, when incorporated with your database and personal message, will burn through the usual barriers and give you ready access to the decision makers in the markets that ABC COMPANY serves.